As memories of the aches, pains and blisters begin to fade for the 35 000 runners who competed in the London Marathon, a handful may now be looking to take on an even bigger challenge to push their limits further. With the infamous Marathon des Sables booked up until 2011, what is left for those athletes brave and mad enough to take their running to the next level? I travelled to Africa with nine runners of all ages and from all walks of life for the first-ever Namibian 24-hour Ultra Marathon and now ask: Could this be the toughest footrace on earth? “It was hot! It was hard! It was awesome! – A true adventure. This race is a must for individuals who wish to test their limits on physical and mental endurance” Pete Holdgate, 2008 Ultra Runner. 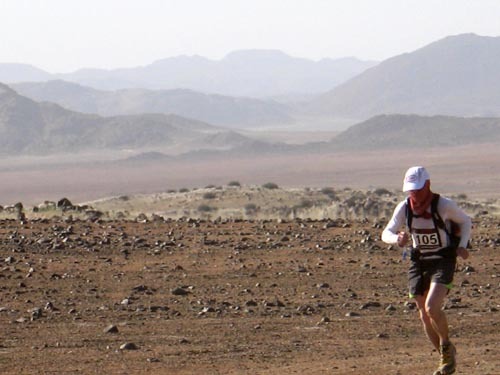 The Namib Ultra Marathon is a marathon with a difference; 120 km in 24hrs across one of the worlds most stunning but challenging desert terrian based around Brandberg the countries highest peak and heading towards the finish line on the infamous Skeleton Coast. The challenge is proving to be a popular one so early sign up is recommended and you can find out more here. Adventure Racing in Namibia. Following is an account as seen from the eyes of a guide/marshal, during this epic event in Namibia organised by Across the Divide Expeditions to find out more about the race visit adventure-racing.org here. About the author. Kobus Alberts is a former park ranger and guide, a director of Wild at Heart Safaris an instructor of Expedition and Wilderness Medicine’s Desert Medicine training course and an acknowledged expert on desert travel. Saw the men for the first time at the Airport when they were collected. Ordinary men of different walks of life. The campsite was just South of the Brandberg Mountain, and the perfect setting for the starting point. The “rest” day, 1 day before the race, me and the participants went for a walk-about in the area. Climbed an inselbergs to get a bird’s eye view of the area. “Uncle Spikes” a.k.a. the sun were out and burning down for everyone to feel. Near the end of the walk some guys were out of water already, just showing how easy it is to misjudge the intense heat and all of this only in the morning part of the day. Results for the Namibia Ultra Marathon Just in…. 3. Joakim (Rolf) Jonsson, 22 hours, 24 minutes – who has never run a marathon before!